On Tuesday, January 27, 2015, Marissa Alexander walked out of jail, but not as a free woman. At yesterday’s hearing, the judge sentenced her to two years of house arrest with an ankle monitor. The prosecutor’s office attempted to argue that Alexander should serve an additional two years of probation after her house arrest ended, but were unsuccessful. Their continued attempts to punish Alexander for defending herself are a stark illustration of the ways in which domestic violence survivors are criminalized and prosecuted. Marissa Alexander’s legal ordeal began over four years ago. In 2010, nine days after she gave birth to her baby girl, her abusive husband assaulted her. Alexander fired a warning shot to stop his attack. Although no one was hurt, she was arrested and charged with three counts of aggravated assault with a deadly weapon. She tried to argue self-defense under Florida’s Stand Your Ground law, but a pretrial judge ruled that she could have left her house instead. Less than three months after George Zimmerman shot 17-year-old Trayvon Martin in what he would later claim was an act of self-defense, Alexander, a black woman, was convicted and sentenced to twenty years in prison under Florida’s “10-20-life” sentencing law. In 2013, an appeals court overturned her conviction, remanding her for a new trial, but the court also stated that, if she were convicted, Alexander’s sentences must be served consecutively rather than concurrently. The prosecutor once again charged Alexander with three counts of aggravated assault with a deadly weapon. This time, if convicted, Alexander would face sixty years in prison, twenty years for each count. In November 2014, Alexander agreed to a plea bargain that included time served for the 1,030 days she had already spent behind bars, an additional sixty-five days in jail and two years of house arrest. For years, antiviolence activists of color, along with organizations such as Beth Richie and INCITE! Women, Gender Non-Conforming, and Trans people of Color Against Violence, have noted that, by criminalizing survivors, the legal system replays, in institutional form, the domestic violence these women suffered. “Every time the state shames, blames, and punishes victims of domestic and sexual violence, it legitimizes that violence,” members of the Free Marissa Now campaign tweeted hours before the sentencing. While Alexander’s case has often been discussed as an example of the racial bias of the legal system, the intersection of her race and gender cannot be overemphasized. When domestic violence is discussed, the “perfect victim” is usually portrayed as middle-class and white; she is also almost always submissive, loving and, most important, nonviolent. So when she defends herself (or her children), a woman defies ingrained expectations of what a “perfect victim” should be and, for police, prosecutors, judges and juries, relinquishes any consideration of the circumstances of her action. In the case of a woman of color, who is already less likely to be deemed worthy of legal protection, the situation becomes even more tangled: by defending herself, she negates any claim she may have had to being the victim and gets framed as the aggressor. Since no national agency is tasked with keeping track of how many people are imprisoned for self-defense or other abuse-related convictions, there is no way to tell how many women are in similar positions. However, the few existing studies indicate that the rate is fairly high: in New York State, for instance, 67 percent of women imprisoned for killing a person close to them had been abused by that person. While that may seem high, a study in a California prison found an even higher rate: 93 percent of the women imprisoned for killing their partners had been abused by them. Of these women, 67 percent reported that they did so while defending either themselves or their children. But rather than recognizing them as victims of violence and offering assistance to heal from trauma and rebuild their lives, the legal system frequently criminalizes and prosecutes survivors for these desperate acts of survival. It’s telling that the legal system employs many of the same strategies that abusers often use to keep their victims under control—doubting, downplaying and denying experiences of violence and trauma. In a country that claims to care about women and ending violence against women, why does our legal system mimic the tactics of abusers? Why are survivors forced to relive—in fact, prove—their experience of trauma and violence for doubting strangers? Despite the purple ribbons, the month dedicated to domestic violence awareness and the Violence Against Women Act, the United States, as a whole, disbelieves survivors and often blames them for their abuse. We see this in the questions asked. When hearing about domestic violence, people frequently ask, “Why did she stay? Why didn’t she leave?”—rather than “Why does this person keep hurting the person he claims to love? Why doesn’t he stop harming her?” We see this each time a woman has to fight for an order of protection against her abuser, and then hope that the order is enforced. Our legal system reflects society’s attitudes towards domestic violence and, by extension, women—the belief that they are either embellishing their accounts of violence or, if not, that they are somehow to blame for not stopping the violence. In the legal system, we see this disbelief every time a survivor needs to call an expert in domestic violence to prove that she was, indeed, battered. We also see it each time a survivor does not know that she needs such an expert to testify on her behalf. We see it in the lengthy prison sentences threatened and meted out to survivors. 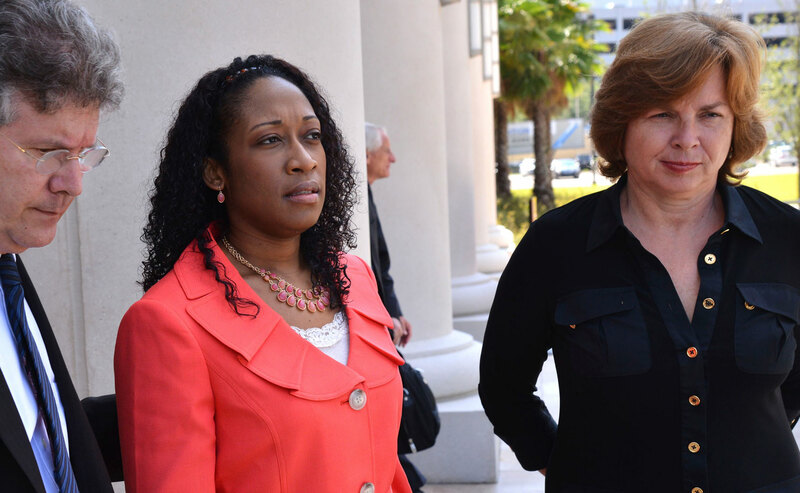 Had Marissa Alexander not accepted a plea bargain, she risked a sixty-year sentence. That’s powerful incentive to plead guilty, even if it means that, for the next two years, Alexander will effectively be imprisoned in her home. She will be allowed out only to go to work, school, church, her children’s school or approved appointments. Unless she is granted a pardon, she will have to live with the stigma of a felony conviction for the rest of her life. The criminalization and continued prosecution of Marissa Alexander is the norm, not the exception, in how abuse survivors are treated. What’s exceptional is the amount of publicity—and ensuing outrage and organizing—Alexander’s case has engendered. “Although the journey has been long, and there have been many difficult moments, I could not have arrived here where I am today without the many thoughts and prayers of so many people who have voiced their support and encouragement,” Alexander said to the media after her release. But countless other survivors caught in the legal system face their ordeals alone. No one organizes teach-ins, raises money to cover legal costs or calls for national days of action to draw attention to their cases. There are no friendly faces packing the courtroom to cheer them on. Instead, many are convicted and quietly begin serving lengthy, if not life, sentences. Alexander has recognized this and asked her supporters to use her prominence to help draw more attention and support to other incarcerated abuse survivors, such as Tondalo Hall, as well as others imprisoned for self-defense, such as Charmaine Pfender. Unless the culture around domestic violence and self-defense shift, there will continue to be many more survivors who are criminalized, prosecuted and threatened with a living death simply for trying to stay alive.